Trips depart daily from Tobermory pontoons at 11.30 for our 4 hour whalewatch trip. 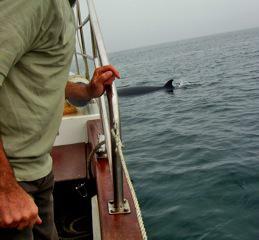 So come on BOOK NOW and join us on one of our Whale/Wildlife Sea Safaris. Our boat log is full of amazing sightings so come along and join us to make this year the best one yet. Make sure you wrap up warm, even on sunny days to see Mull and surrounding islands at their very best and at close hand. Leaves Tobermory daily from Ledaig pontoons 10.00 and 15.30. Price: £30 per adult, £20 per child. On this cruise we head out into the Sound of Mull, spotting for seals, Golden and White-tailed eagles, Harbour Porpoises, Kittiwakes, Shags, and Manx Shearwaters. All sightings are logged with HEBRIDEAN WHALE & DOLPHIN TRUST for research purposes. Remember to bring your camera, a snack to eat and wear plenty of warm clothing and footwear.